Once you have obtained the Card Key after the Multi-Battle with Team Rocket Admin Archer on the fifth floor of Silph Co, you will be able to open all the doors on every floor of the building. 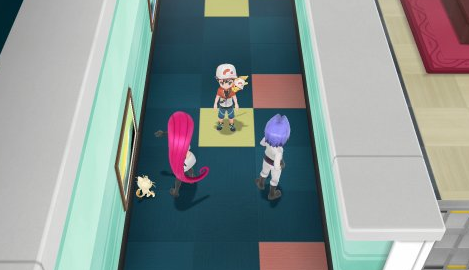 This will make it much easier to navigate through the numerous floors of the structure, with your goal being to stop Giovanni, the Leader of Team Rocket, of the eleventh and final floor in order to stop the takeover. However, right as you make it to the eleventh floor and are about to head into the President's Office to stop Giovanni, Jessie and James will appear and will force you to battle them. They must be defeated in order to proceed to Giovanni.